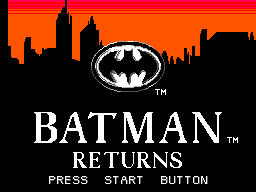 Batman Returns for the Sega Master System, like its cousins, is a sidescrolling action game, though contains different levels and gameplay mechanics. It is based upon the 1992 Batman Returns film. The game received favourable reviews. 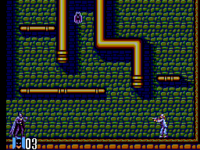 Batman Returns is a platform game with simple mechanics. Batman can use his "Batarangs" for attacking enemies with and can jump with . By pressing quickly in mid air, Batman can swing around with his grappling hook. Batman can also glide in the air by pressing and holding in mid air. There are a few power ups in the game which can be acquired by hitting the bat symbols with Batarangs. Red symbol give one extra life. Grey symbol increased power and speed of Batarangs while the Yellow symbol increases Batman's walking speed. 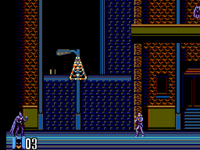 Unlike the Sega Game Gear version, Batman has no life bar, with one hit being enough to bring him down (this is however compensated by game's abundance of extra lives). It is otherwise relatively similar to the Game Gear version except some differences. 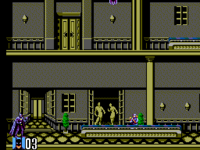 Batman Returns on the Master System contains a total of five stages which are divided into several sections. At the beginning of each chapter, players choose between one of the two routes. 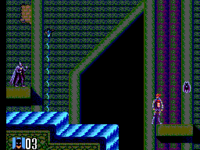 Route A is typically shorter and easier one, while Route B is harder with many large pitfalls. At the end of each stage there is a boss which must be defeated in order to proceed. Penguin's thugs are raising havoc in the streets. Contain the situation and defeat Penguin's flame breathing giant henchman. Stop the marauding robbers in Shreck's shopping mall and face the mysterious Catwoman. Battle on the tops of Gotham's highest buildings as you follow Penguin's trail. You are one step away from Penguin's hideout. Survive the endless traps and a get ready for a rematch with Catwoman. Prepare for final battle as you face countless of Penguin's goons. He is waiting you at the end with his customized "tank". 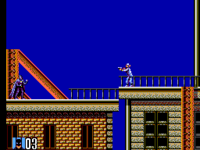 Main article: Batman Returns (Master System)/Magazine articles.